The Chargers Football Club formed the first peewee team in the City of Edmonton in 1992. They participated in the St. Albert and District Minor Football League. At that time and in that league, there were weight restrictions. Large players were identified with a red stripe down the centre of their helmets. The season was a learning experience for all. In 1994, the Peewee team was no longer just rookies. We were still playing in the St. Albert and District Minor Football League. The team had a very successful season and ended up as the Tier II Champions. The Chargers Peewee Football team had an incredible year in 1995. They ended up in first place in the St. Albert and District Minor Football League. After a number of exciting playoff games they won the Tier I Championship. In 1996, Chetan Gosavi took over as Head Coach. The team was now part of the Capital District Minor Football Association. With more teams to play the team faced more challenges but overall had a successful season. The Peewee team continued to build in 1997 and for the first time faced opponents from Sherwood Park, who had just joined the new association. The team worked hard and learned lots about the game. The Chargers Peewee team in 1998 had a very successful regular season. In post season play , they only lost one game to become the Capital District Minor Football Association Tier II Champions. In 1999, the Peewee team lost only one regular season game and tied one other one. The team had 160 points for and only 22 points against in the regular season. They won all of the playoff games to become CDMFA Peewee Tie I Champions. They proceeded to Peewee Provincials in November where they lost to the powerful Calgary Cowboys. The Chargers Peewee team in 2000 had a record of 6 - 1 - 1 with 129 points for and 31 points against. They were successful in League play off games to become the CDMFA Peewee League Champions for the second year in a row. The Peewee Provincial Championship against the Calgary Wildcats in Edmonton was a close game with the Chargers Peewee team coming out of top. In 2001, the Chargers Peewee Football team had a record of 5 - 2 - 1, with 168 points for and 53 points against. They won the Capital District Minor Football Association Tier I Championship for the third year in a row. The Peewee Provincial Championship against the Calgary Wildcats ended 34 to 21 for the Chargers, making them Football Alberta Peewee Provincial Champions for the second year in a row. James Devine became the head coach of the Chargers Peewee Team in 2002. The team had a large number of rookie players and for the first time in years did not fare well in playoff games. The Peewee team started a bit slow in 2003 but finished the season very strong. They ended up winning the Capital District Minor Football Association Tier II Championship. In 2004, the team was again undefeated, winning 7 regular season games with 205 points for and only 8 points against. They lost their first game of the season in game one of the playoffs, moving them to Tier II. The team refocused and didn't lose a game after that, beating the Calgary Mavericks 40 - 2 in the inaugural Football Alberta Peewee Tier II Provincial Championship. The Chargers Peewee team finished in fourth place in the John Bright Division of the Capital District Minor Football Association for 2005 with 6 wins and 3 losses. According to league rules this entered them in the Tier II side of the playoffs. After defeating the Camrose Buffalos and the Stettler Panthers, the team went to Calgary for the Peewee Tier II Championship where they played the Foothills Eagles. 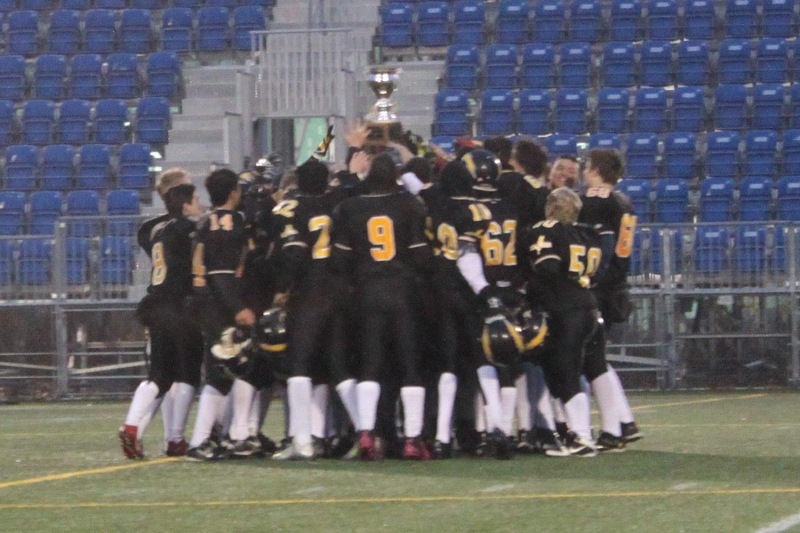 In a game that went down to the final second, the team came out of top 28 to 26, making them the Football Alberta Peewee Tier II Provincial Champions for the second year in a row. Peewees The 2006 Chargers Peewee team had a very successful year until playoffs rolled around. Bad weather causing game delays resulted in a lack of focus during the final playoff game creating an early end to the season. Despite the season end, the Peewee team had a great group of players who had lots of fun on and off the field. In 2007, David Snook took over as Head Coach of the Chargers PeeWees. While the season could be called trying, the team made great strides and showed flashes of what was coming. 2008 and 2009 were dominating years by Chargers, winning the CDMFA Tier I title both years and ending with a gold (2009) and silver (2008) at the Provincial level. 2010 saw some changes in Coaches, but the end result was very similar as the Chargers Three-Peated as CDMFA Tier I Champs and brought home silver from the Provincial Final.